Travel (when you’re a young historian) isn’t always about seeing historical sites and learning the history of historical buildings and the ghosts that live in them. Sometimes it’s not even about history, its about the present. On my most recent trip to New Orleans, I was out on a late afternoon walk in Jackson Square, it was about 40 degrees and 95% humidity, so it was hot and foul and I was feeling pretty sad about life. I know, I know, I should have been tickled with glee over the fact that I was wandering around, with no itinerary, in one of the most fun, enticing, intriguing cities in the world… but if you’d been in that kind of oppressive heat, wearing jeans (as a public service, I don’t do shorts) you might have felt somewhat differently too. When you’re in heat like the kind of heat you get in New Orleans in the summer, you start to question your life choices and before you know it, the only thing that seems viable is getting to the closest possible air conditioner. Anyway, I was feeling like I was going explode into a cloud of summery vapour and drift away over the Mississippi, when suddenly I smelt beignets and heard a beautiful sound. It was a saxophone. A mournful, blues sax and it was being played by someone who know how to play the hell out of it. 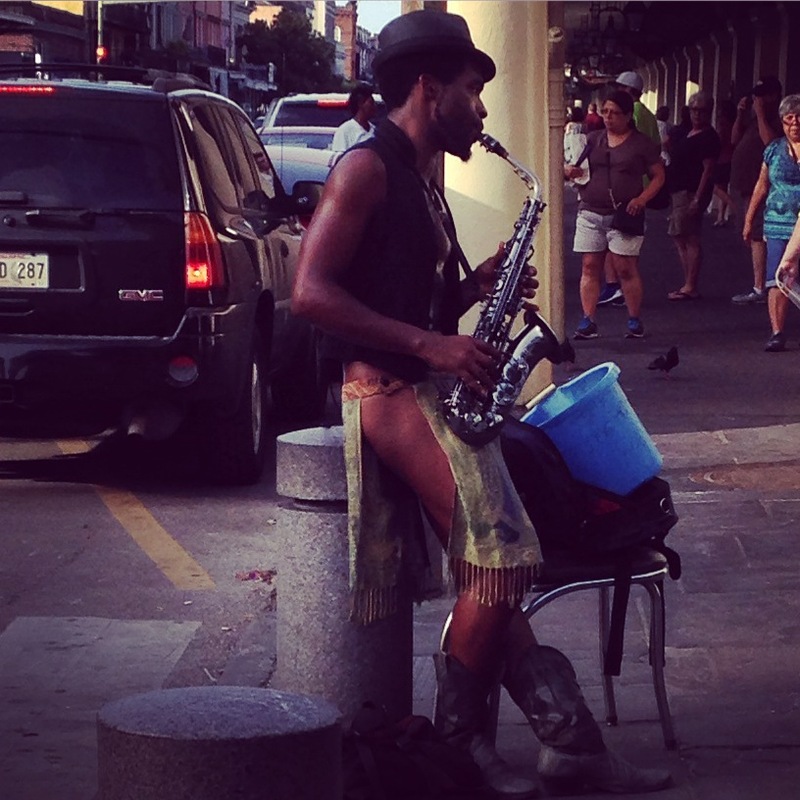 I don’t know who this man is, what he does for a living, where he was raised or how he came to be in the French Quarter on that filthy, humid afternoon, belting out tunes on his saxophone – but he was there and it was magic. If I was more of an extroverted personality, I might have tried to engage him in conversation when he was finished his tune… then again, that might have meant he stopped playing…it’s hard to play a sax and hold a conversation with a strange woman after all, so instead, I just bought my tenth helping of beignets for the week and stood on the outer circle of the crowd that was gathered around him, enjoying the music for a few moments. Ultimately, watching the breeze flutter under the fringe of his loin cloth was making me uncomfortable (I don’t think he had anything under it) and so I had to move on. I do appreciate the fact that he was wearing a loin cloth/ vest/cowboy boot combo in the first place though. It’s little moments like this are what makes travel worth it. Great post! Sometimes when you’re wandering around, magic happens 🙂 New Orleans is one of my favorite cities in the world! His name is Steven and yes he is a great saxophonist.